Tipbet is a German betting site that was founded in the distant 1995 and the company now focus on bets online, but at the same time it is also taking part in offline with many gambling shops in all Germany. Sponsor of various sports teams, Tipbet is based in Malta and has an active license in Malta and Curacao. In 2016, the bookmaker released casino games online, trying to attract more and more players from this field of stakes. Sports and casino games are on the same website, and for both types of games one registration is required. Something interesting about double licensing in the case, that when you load the website for sports games and soccer matches, you are under Malta’s jurisdiction but when you enter some casino games you get a message that you are now entering Curacao jurisdiction. However, the bookmaker is licensed for Sports and Casino. Tipbet has been in the field of sports betting for more than 20 years via German landing sites and recently through an online site with the advantage, unlike other sportsbooks, that there is almost no registration limits from different countries and main purpose is to attract customers from around the world. Sports, Live, Slot, Live Casino, Virtual Sports and E Sports. We are impressed by the big font and that the main sports are very well visible, even by non-professionals in the industry. The Cash Out option is also available and it’s one plus, that you can risk less, than losing. At the bottom of the site we also notice the Live Chat button. The registration of the account at Tipbet is done in two steps, first by clicking the “Sign up now” button, then filling in your personal details, such as first name, surname, address, contact phone number, e-mail. The next step is for the details of your account, where you need to create a user’s name and password, and write the correct drop code/capcha/. Please, keep in mind that the data must be filled in correctly, otherwise you may have trouble with Tippet withdrawals. Credit and Debit Cards Maestro, Visa, Visa Electron, Master Card and also Skril, Netteller, Paysafecard, Sofort Banking, EcoPayz, Sofort Banking. The minimum deposit amount is 10 euros, with the Pay Safe Card option only 1 euro, but you need to check if your payment service provider is operating in your country. To withdraw funds, use the method you have selected for a deposit and the minimum withdrawal amount varying from 10 to 25 euros. 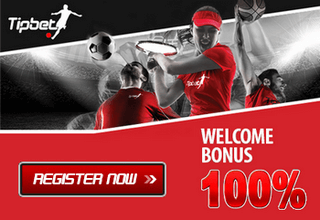 Tipbet offers an initial 100% Sports bonus, with the bonus for new bookmaker customers only. With a deposit of 100 Euro, you will receive 100 Euro extra and you will have 200 Euro per game. Please read carefully the requirements for turnover the bonus in Rules and Terms of Service. The bonus can be used for sports events, as well as for live sport events, offered in the bookmaker. In the Casino section, users can also get a bonus, which is a € 7 No Deposit Bonus – Tipbet Casino, where you get € 7 from the game company, but the withdrawal conditions are a lot more difficult. However, you can try out your favorite games and find out if you like the casino. Tipbet bookmaker offers more than 30 types of sports betting, such as Football, Basketball, Ice Hockey, Handball, Volleyball, Cricket, American Football, Rugby, Boxing, Snooker, Baseball, Badminton Futsal, Beach Volleyball, Darts, Tennis Mass, Moto Sport, Winter Sports and more. Non-traditional sports are also available. The minimum bet on a system column is € 0.10 and the maximum bet per column is € 500. In the Virtual Sports section, you can also find football, basketball, tennis, horses and dogs available 24 hours per day and 7 days a week. Another advantage over many other bookmakers is E-sports, where Tipbet has great success and they also sponsor AD Finem’s team and provide rights for ESL for sports events. Roulette, Live Blackjack, Live Baccarat, Live Casino, Hold’Em, Live Dice Games, Immersive Roulette, Dream Catcher and more. The live casino consists of real dealers and three different providers and with the largest number of games is Evolution Gaming. The bookmaker offers the following support options: 24/7 Live Chat and Email support@tipbet.com. So far, phone contact with customers is not available.